Transmitters used in telemetry studies are typically surgically implanted into the coelom of fish. When large numbers of fish are implanted consecutively, as in large telemetry studies, it is common for surgical tools (such as scalpels, forceps, needle holders and sutures) to be sterilized or, at minimum, disinfected between each use to minimize the transfer of pathogens. Chemicals are commonly used for disinfection but they can potentially harm fish and surgeons. UV radiation could provide a safe and more effective means for disinfection. The efficacy of UV radiation was determined for disinfecting surgical tools exposed to one of four aquatic organisms that typically lead to negative health issues for salmonids. The organisms include Aeromonas salmonicida, Flavobacterium psychrophilum, Renibacterium salmoninarum, and Saprolegnia parasitica, the causative agents of ulcer disease, coldwater disease, bacterial kidney disease, and saprolegniasis (water mold), respectively. In the first experiment, forceps were exposed to three species of bacteria at three varying concentrations. After exposure, tools were placed into a mobile Millipore UV sterilization apparatus. The tools were then radiated for three different time periods – 2, 5 or 15 minutes. UV radiation exposures at all durations were effective at killing all three species of bacteria on forceps at the highest bacteria concentrations. In the second experiment, stab scalpels, sutures and needle holders were exposed to A. salmonicida using the same methodology as used in Experiment 1. UV radiation exposure at 5 and 15 minutes was effective at killing A. salmonicida on stab scalpels and sutures but not needle holders. In the third experiment, S. parasitica, a water mold, was tested using an agar plate-method and forceps-pinch method. UV radiation was effective at killing the water mold at all three exposure durations. Collectively, this study shows that UV radiation appears to be an effective disinfection method for some surgical tools. However, we do not recommend using this method for tools that have overlapping parts, such as needle holders, or other structures that cannot be exposed directly to UV radiation. In the United States, the Animal Welfare Act mandates that aseptic surgery technique be used when performing surgery on warm-blooded animals, which excludes fish. However, research using fish must be reviewed by institutional animal care and use committees , which generally require researchers to follow similar guidelines used for homeotherms. One requirement is that surgery be done using aseptic technique. Unfortunately, when tagging fish, it is impossible to be completely aseptic because fish live in an aquatic environment and therefore the surgery site is exposed to water potentially carrying pathogens into the coelom of the fish. There has been some research done looking at aseptic versus non-aseptic surgeries on fish. One such study done by Chomyshyn et al. found no benefit to aseptic technique when conducting intracoelomic implantation of tags in fish. Aseptic technique also doubled the time it took for surgery and increases in surgery time are believed to adversely affect fish recovery and survival. Therefore, there is a need to find ways that effectively reduce the chances of spreading pathogens from fish to fish but also keep surgery times at a minimum. Juvenile salmonids are often surgically implanted with transmitters to monitor behavior and survival during seaward migrations. Researchers conducting telemetry studies assume that tagged fish are representative of non-tagged fish [3, 4], but the presence of telemetry tags and the tagging process may influence growth, behavior, and survival. This results in tagged fish not being representative of the population, potentially leading to biases in these studies [5, 6]. In addition, the surgical process can expose juvenile salmonids to harmful aquatic diseases, which can alter survival rates and increase the occurrence of disease compared with untagged populations. To minimize the risk of transmitting pathogens among fish when surgically implanting transmitters, protocols must be in place to reduce or eliminate harmful organisms on surgical tools. Ideally, the protocols would include the use of a sterile set of tools for each fish. But when large numbers of fish are implanted (as is common in the Columbia River basin; ), providing a separate tool set for each implantation can be a logistical challenge. A relatively rapid and inexpensive technique is needed for disinfecting or sterilizing surgical tools between surgical implantations to prevent transmission of aquatic diseases. Sterilization, by definition, means that all microorganisms, endospores, and viruses are destroyed . Sterilization of surgical tools can be accomplished by steam, dry heat, chemical vapor, or immersion in chemical sterilants for 6 to 10 hours . For example, autoclaves use high pressure and steam for sterilization and are commonly used in laboratories and hospitals to sterilize tools because of their efficacy at inactivating viruses and spores that can be harder to inactivate than vegetative bacteria . The disadvantage of autoclaves is that they are often expensive, large and heavy (although tabletop units are portable) and cannot be used with heat-labile items. In addition, a complete autoclave cycle can take approximately 1 hour to run, which is not always conducive in large applications or a field study. Nearly all available sterilization techniques are time-consuming and may, in some circumstances, compromise the study objectives (for example, telemetry studies during defined fish migration periods) or the health and wellbeing of the fish (for example, excessive surgical times that result in extra handling of fish ). As such, there is a need to use adequate disease management within reasonable time periods; currently available sterilization techniques may not always provide that option. Disinfection, which is the elimination of most disease-causing microorganisms or viruses but not necessarily spores, is a more reasonable option because it can be done in a relatively short time (for example, 20-minute submersion of tools in 70% ethanol ). Different levels of disinfection can be accomplished using liquid chemicals or wet pasteurization, depending on the disinfectant used and exposure time. A high-level disinfectant will kill all microorganisms except a large number of bacterial spores, while a low-level disinfectant will kill most vegetative bacteria, some fungi, and some viruses . Ethanol and isopropyl alcohol, commonly used in the Columbia River basin as disinfectants, are effective for killing vegetative bacteria, fungus, and viruses but not bacterial spores . However the most common bacterial fish pathogens found in the Columbia River basin do not have a spore life stage. Although the use of chemicals (such as ethanol, hydrogen peroxide, Virkon, chlorhexidine) is effective for the disinfection of surgical tools , some products commonly used may pose threats to the health of both tagged fish and surgeons. The most common health effect of acute exposure to ethanol, hydrogen peroxide, Virkon, and chlorhexidine is irritation of the skin, digestive tract, and lungs. Chronic exposure can result in more severe injuries based on their respective material safety data sheets. Further, the use of most chemical disinfectants results in waste that must be disposed of properly, which can be very expensive (although evaporation of small amounts of chemical disinfectants like alcohol may be possible). Thus, there is a need to identify other disinfection techniques for use on surgical tools used for performing surgeries on fish. UV radiation is generally used for the disinfection of water in aquaculture and wastewater facilities because it does not produce any known toxic residuals or byproducts that may pose a risk to people or fish [12–15]. UV radiation is also used to improve air quality within buildings . Although intense UV radiation can be harmful to operators if used improperly, proper equipment and use can mitigate impacts. However, despite its widespread use, there is a lack of information available on the efficacy of UV radiation for disinfecting or sterilizing surgical tools. The UV spectrum is commonly subdivided into three sections: UVA (wavelengths of 400 nm to 315 nm), UVB (315 nm to 280 nm), and UVC (280 nm to 200 nm). UVC radiation denatures the DNA of microorganisms, which have a high absorbance of the UV spectrum at 254 nm. Denaturing is caused by the formation of pyrimidine dimers, resulting in the inactivation of the bacterium by blocking DNA replication [12, 14, 17]. Although the entire UV spectrum has been known to kill or inactivate many microorganisms, some researchers suggest that a wavelength of 254 nm (UVC) is most effective [14, 16, 18]. Thus, Summerfelt  suggests that monochromatic UVC radiation is the industry standard. The type of radiation varies not only with the wavelength of the UV light source but also with the quantity of the energy transmitted (in millijoules per square centimeter (mJ/cm2) ). The dosages required for inactivation of pathogens vary. However, some research suggests that the most common bacteria and viruses can be inactivated by UV doses of 30 mJ/cm2 at a wavelength of 254 nm; for example, infectious hematopoietic necrosis virus is inactivated at 2 mJ/cm2 . Conversely, mold and fungi require greater exposures at certain life stages; inhibition of Saprolegnia spp. hyphae growth requires 230 mJ/cm2 . The objective of this study was to test the efficacy of UV radiation (using a wavelength of 254 nm) as a disinfectant of common surgical tools that were exposed to the bacteria and water mold that cause some common diseases of fish [20–22]. In our first experiment, we exposed forceps to Aeromonas salmonicida, Flavobacterium psychrophilum, and Renibacterium salmoninarum, which are the causative agents of ulcer disease, coldwater disease, and bacterial kidney disease, respectively. In the second experiment, we expanded the number of surgical instruments to include stab scalpels, needle holders, and suture material and exposed them to A. salmonicida (ulcer disease). Finally, in our third experiment, we explored whether UV radiation was effective at killing the common water mold (Saprolegnia parasitica) at the mycelium life stage on an agar plate and on surgical forceps. The pathogens used in this study were chosen because they represent Gram-negative bacteria, Gram-positive bacteria, and an oomycete, a fungus-like microorganism. The tools chosen for the experiment were made of various materials (stainless steel, plastic, and Monocryl monofilament thread) and various surfaces (smooth, grooved, and overlapping) that are commonly used in studies where fish undergo surgical implantation of transmitters. In all cases, we attempted to use surgical tools and techniques common to a broad range of fisheries studies . As such, we believe the results of our study will be of interest to fisheries researchers and managers, not only in the Columbia River basin but in any area where surgical procedures are used on fish potentially exposed to these or similar diseases. Dose measurements were consistent among tests. Mean (± standard deviation) doses were 108.87 (±5.20), 319.63 (±17.51), and 1051.02 (±67.54) mJ/cm2 for the 2-minute, 5-minute, and 15-minute exposures, respectively. We hypothesized that UV radiation would be effective at disinfecting forceps exposed to three species of bacteria. The UV sterilizer was effective at reducing the population of all three disease-causing bacteria applied to forceps (Table 1). Growth of A. salmonicida and F. psychrophilum was consistently negative for forceps exposed to all bacteria concentrations and then treated with the UV sterilizer. Growth of R. salmoninarum was negative for all high concentrations. However, because there was not any growth in four of the five medium-concentration sham controls or in all of the low-concentration sham controls, the results for medium and low UV radiation-treated samples were not included. One of five replicates of the negative control (15-minute UV exposure test) for R. salmoninarum showed growth. The suspect sample was plated on agar, incubated, and grown for 7 days. The growth was determined to not be R. salmoninarum, indicating that this growth was due to environmental contamination and not cross-contamination of R. salmoninarum. The (+) symbol represents growth in samples for each replicate of the test while the (−) represents no growth in samples for each replicate; the number of replicates for R. salmoninarum was five versus three for the other two bacteria. ‘None’ represents the negative control. UV radiation was effective at reducing the population of A. salmonicida at all densities on sutures, but results were variable for stab scalpels and needle holders (Table 2). However, for sutures, only two of the three low-concentration sham controls had growth. Growth of samples from stab scalpels was negative for all UV radiation-treated samples except for one of the 2-minute high-pathogen concentration samples. UV-treated samples for needle holders exposed to medium and high levels of A. salmonicida had growth in all three replicates for all exposure durations tested. The (+) symbol represents growth in samples for each replicate of the test; the (−) represents no growth in samples. ‘None’ represents the negative control. The last part of the hypothesis was to test the efficacy of UV radiation to disinfect tools exposed to a water mold. There was no growth of S. parasitica on any of the agar plates exposed to UV light. Mycelium growth was observed on all three of the sham control plates after 1 day of incubation. The forceps-agar pinch test did not show any growth in the UV-treated samples after either 5 or 10 days of incubation. However, growth was observed in only two of the three sham control groups after 2 days of incubation, and at 10 days there was no change (Table 3). The (+) symbol represents growth in samples for each replicate of the test while the (−) represents no growth in samples. The effective management of pathogens during the surgical implantation of tracking devices into fish is critical for the survival and wellbeing of the test fish as well as maintaining their behavior and ecology. Sterilization as opposed to disinfection of surgical instruments is the most effective means to manage pathogens, but because time is a potential factor in the successful outcome of surgery in fish , disinfection techniques are required to manage pathogens when tagging large numbers in the field. Because most of the disinfectants commonly used today in fisheries studies have certain inherent drawbacks, there is a need to find new and innovative ways to disinfect surgical instruments. This study suggests that use of UV radiation, in some circumstances, may be a viable disinfection procedure for fisheries studies involving surgery. In the first of our three experiments, we showed that the high concentrations of bacteria applied to forceps (1.8 × 1011 colony-forming units (CFU)/mL to 6.3 × 1012 CFU/mL) were effectively reduced using UV radiation in dose durations between 2 and 15 minutes. These bacteria represented the pathogens that cause ulcer disease (A. salmonicida), coldwater disease (F. psychrophilum), and bacterial kidney disease (R. salmoninarum). For A. salmonicida and F. psychrophilum, our tests showed that they were killed with UV radiation at low (1.8 × 107 CFU/mL to 5.8 × 107 CFU/mL) and medium (1.8 × 109 CFU/mL to 5.8 × 109 CFU/mL) concentrations; this conclusion is based on the fact that the bacteria were able to grow at these concentrations on forceps in our sham tests but then evidenced no growth in the UV-treated samples. Even though there was not consistent observable growth of R. salmoninarum on the forceps following UV treatment in the tests using low (6.3 × 108 CFU/mL) or medium (6.3 × 1010 CFU/mL) bacteria concentrations, we cannot conclude with absolute certainty that the UV radiation was the reason for no bacteria growth because the sham tests were not reliable. The lack of growth in the R. salmoninarum sham tests at the low and medium concentrations could have been due to the difficulty associated with culturing this bacteria, requiring up to a month of incubation time to reach a population threshold where the bacteria is visible to our counting method. In each replicate, where R. salmoninarum was grown in a sham test, it was effectively eliminated using the UV treatment. The hypothesis is that if R. salmoninarum are eliminated at high concentrations, it is likely that it would be eliminated at low concentrations. Further, even the densities of organisms present in the low-concentration exposures in this study are likely much higher than levels found in a river or fish-tagging site. For example, McKibben and Pascho  found that tanks holding Chinook salmon infected with R. salmoninarum contained only 1.8 × 103 CFU/mL. This level is much lower than the lowest level of R. salmoninarum to which surgical tools were exposed in this study (6.28 × 108 CFU/mL). Consequently, even with the lack of conclusive findings in the low and medium concentrations, our results give us confidence that the UV radiation is able to kill R. salmoninarum at concentrations that may cause disease in juvenile salmonids. In the second experiment, it was shown that A. salmonicida was killed with UV radiation of duration doses of 5 and 15 minutes all of the time on suture material and stab scalpels, but inconsistently on needle holders. For the suture test, only two of the three low-concentration sham controls grew. However, because all other sham controls in the medium and high concentrations did grow and there was no growth in any of the UV radiation-treated samples, it can be said that UV radiation was effective at disinfecting the suture. A 2-minute treatment with UV radiation was not always effective at killing high concentrations of bacteria on the stab scalpels but worked on the suture material. Concentrations of bacteria used in this experiment ranged from 1.4 × 104 CFU/mL to 5.9 × 1011 CFU/mL. The hypothesis for the inconsistent results on the stab scalpels (at 2-minute treatment) and needle holders (at all treatments) is that these surgical tools have irregular and hidden surfaces that can harbor bacteria, making these surfaces inaccessible to the UV radiation. Other researchers have found that UV light can be ineffective at killing microbes in dental tools that are tubular or have irregular surfaces . The pathogen must be ‘visible’ to the UV system for the UV system to be an effective disinfectant. Due to these hidden surfaces, the UV system is likely an inferior method with which to disinfect surgical tools like needle holders that have overlapping joints. Although our tests showed that bacteria was not able to grow on suture material after UV treatment of durations of 2 to 15 minutes, the location where the suture strand is attached to the needle may be an area of concern for harboring bacteria or other pathogens. In addition, a buildup of organic or inorganic debris can shield organisms from exposure to UV light. Therefore, tools should be cleaned to remove debris prior to sterilization or disinfection . In the third experiment, we showed that forceps exposed to water mold were effectively disinfected when treated for 2 to 15 minutes with UV radiation. However, as in the experiment with R. salmoninarum, one of the three sham tests failed to grow the water mold. Therefore, these findings must be interpreted with caution. We are encouraged, however, that in the agar-plate method where there was growth of the water mold in all three sham replicates, the UV system effectively killed the water mold at UV radiation durations between 2 and 15 minutes. The collective finding of this study is that exposure to UV light appears to be a viable technique for disinfecting at least some tools used to implant transmitters into fish. Forceps and suture material, which were fairly smooth and did not harbor pathogens in areas inaccessible to the UV radiation, were effectively disinfected with UV radiation. However, those tools that had overlapping or complex parts presented areas that the UV radiation was not able to reach. We recommend that other methods be used to disinfect or sterilize these tools. One rapid, non-chemical method would be use of a hot bead device, which heat small glass beads to 218°C to 270°C. The hot bead devices can disinfect tools in as few as 3 seconds however a sporicidal effect can be achieved in 45 seconds at 220°C [26, 27]. The Millipore UV system is not considered an approved sterilizer by the U. S. Food and Drug Administration (FDA). However, at a minimum, UV radiation has promise as a high-level disinfectant because it is effective against vegetative bacteria, fungus, and bacterial spores [28, 29]. There are many problems with determining sterilization versus disinfection. Sterile means ‘to have zero organisms survive; however, the FDA sterilizer testing process calls for a sterility assurance level of 10-6 . This is measured as a probability of sterility for each type of item to be sterilized and is the log10 number of the probability of a survivor on a single item . A sterility assurance level of 10-6 is the level used most commonly for sterile tools in the United States . The FDA has not approved either UV or hot bead devices as instruments for sterilization. No single standard has been established in proving a UV system to be a sterilizer nor are any UV units FDA-registered sterilizers. Hot bead sterilizers are acceptable for sterilization in veterinary medicine  but, like UV, are not FDA registered. The FDA governs chemical sterilants, high-level disinfectants, and sterilization equipment such as autoclaves and dry heat ovens. The FDA has registered sterilizers that use steam, dry heat, and gas plasma. Unfortunately, all three sterilizer types require a long time to sterilize tools. For a device or chemical to be certified as a sterilizer, it must be able to kill the most resistant organism for the specific sterilization process being tested. Traditional devices such as steam sterilizers are most commonly tested using Geobacillus stearothermophilus in the spore life stage, which can take 1 to 2 minutes at 121°C to be deactivated because the organism is heat resistant. The UV system tested in our experiments was effective at deactivating spores of G. stearothermophilus (ATCC:7953; 3.1 × 105 spores/unit) at a treatment duration of 5 minutes (unpublished data). The limitations of UV radiation (that it requires direct contact with the tool surface) might limit its practical use in medicine as a high-level disinfectant but under certain situations it is a viable tool for fish biologists when tagging fish. Additional future research is needed to determine if suture tensile strength is affected by UV radiation over time. This may be a concern; other researchers have noted UV radiation reduced the tensile strength of man-made fibers . If exposure to UV radiation weakens sutures substantially, then incisions may not stay closed, leading to poor healing and tag expulsion, which may lead to bias in the results of telemetry studies. Using UV as a disinfectant has some drawbacks and may not be suitable under all circumstances. One drawback of the UV apparatus is that it requires an external power source, so tagging in field locations would require a generator or battery and power inverter. The UV light sources need adequate safety mechanisms to prevent exposure of people to UV light during use. Also, the bulbs lose power over time and need to be replaced, however the bulbs are relatively inexpensive and are readily available. UV radiation was effective at disinfecting forceps exposed to three species of bacteria and for all UV radiation durations. Even though we did not see any growth in the low- and medium-concentration sham controls for R. salmoninarum, we did have growth in all five of the high-concentration sham controls and no growth in all 15 of the UV radiation-treated samples. Thus, we can conclude that UV radiation is effective at disinfecting forceps exposed to bacterial kidney disease. UV radiation was also effective at disinfecting sutures and stab scalpels, but we did have growth in one of the 2-minute treatments for stab scalpels. UV radiation is not an adequate means of disinfection for needle holders because of the growth present at all durations of UV radiation exposure. UV radiation would be more effective at disinfecting needle holders if the two parts of the tool were taken apart and exposed individually. The water mold was also disinfected at all durations of UV radiation exposure. Due to the growth seen in testing with stab scalpels exposed for 2 minutes, we recommend exposures of at least 5 minutes to UV radiation to adequately disinfect forceps, sutures, and stab scalpels. The UV system used in testing was a Millipore UV sterilizer (Catalog No. XX6370000; Billerica, MA, USA) with four 253.7-nm wavelength Sylvania germicidal UV lamps (Part No. G8T5) with two bulbs in the top and two bulbs in the bottom that does not produce ozone. Each bulb has two anodized aluminum reflectors so that there is maximum exposure of the tools to the UV light. The system is fully enclosed by a fiberglass case (Figure 1C) to prevent exposure of UV radiation to operators and is also equipped with a safety switch that prevents the lamps from energizing while the case is open. The UV system was originally designed to prevent organism carryover on funnels and as an economical alternative to autoclaving . A calibrated radiometer (UVICURE Plus II, Serial No. 15405, EIT Inc., Sterling, VA, USA) was placed in the same location in the UV system during each exposure to quantify the power output (Figure 1A). Millipore ultraviolet sterilizer. (A) UV system interior with forceps placed for treatment. The radiometer is located in the top right-hand corner of the picture. (B) UV system modified by replacing most of the blue center plate with a fused quartz glass that had minimal UV absorption. (C) Exterior of the UV system. During the study, it became apparent that modifications to the UV system were needed to increase the area where tools would be exposed to all four UV radiation lamps. 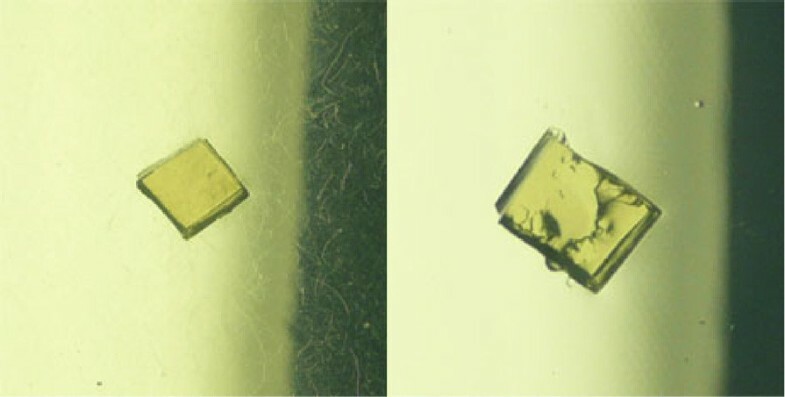 Part of the blue anodized aluminum plate (Figure 1B) was removed and replaced with an optical-grade fused quartz (482.6 mm long × 254.0 mm wide × 6.4 mm thick; Technical Glass Products, Inc., Painesville, OH, USA). The glass used provided maximum transmittance of the UV radiation, whereas standard glass or acrylic absorbs a considerable portion of the UV radiation. The average transmittance of a 10-mm-thick piece of optical-grade fused quartz glass for UV light at 254 nm is approximately 90% . To determine the effectiveness of UV radiation at killing a wide range of microorganisms, three different bacteria and one oomycete were used in the tests. Microorganisms were acquired from American Type Culture Collection (ATCC, Rockville, MD, USA). The three bacteria used were A. salmonicida subspecies achromogenes (ATCC:10801), F. psychrophilum (ATCC:49510), and R. salmoninarum (ATCC:33209). The oomycete (water mold) was S. parasitica (ATCC:11393). All microorganisms were originally propagated following ATCC product information sheets provided with cultures. Bacterial microorganisms were propagated to test the efficacy of UV radiation to disinfect forceps after exposure to A. salmonicida, F. psychrophilum, and R. salmoninarum and to disinfect stab scalpels, sutures, and needle holders exposed to A. salmonicida. This was done by taking a single colony from the solid media and inoculating 1 mL of appropriate liquid media in a 5-mL Falcon culture tube (Becton, Dickinson and Company, Franklin Lakes, NJ, USA). The inoculated broth was allowed to incubate to produce a larger biomass of microorganisms. A. salmonicida, F. psychrophilum, and R. salmoninarum were incubated for 2, 10, and 20 days, respectively. After the incubation, the cultures were serially diluted 10-fold to quantify the density (CFU)/mL) of bacteria in the culture and to attain three bacterial concentrations—low (1:100,000 dilution), medium (1:1,000), and high (1:10). Twenty microliters from each serial dilution was bead streaked on agar plates specific for each organism. After the agar plates were incubated (the length of time described above), colonies were counted and their densities of CFU were determined (number of CFU/volume plated (mL) × total dilution used; Table 4). The density of colony-forming units is shown for each of the two experiments involving bacteria for the different surgical tools. The original culture of water mold was propagated to determine the efficacy of UV radiation to disinfect forceps exposed to water mold. This was done in deionized water and plated out on cornmeal agar plates. Once the water mold grew on the agar, a cube (approximately 5 mm3) of agar with growing water mold was transferred to a fresh agar plate weekly until needed for testing. Growth was easily seen on the cornmeal plates by observing the hyphae (Figure 2). A cornmeal agar plate with S. parasitica growth (left, indicated by translucent strands) and a cornmeal agar plate lacking any growth (right). Four commonly used surgical tools were tested in this study - needle holders, forceps, Monocryl monofilament sutures, and stab scalpels. The needle holders (Model 12002–12, Fine Science Tools Inc., Heidelberg, Germany) were 12 cm long with a cutting edge and a 1.5-mm-wide serrated tip (Figure 3A). The forceps (Fine Science Tools Inc.; Figure 3C) were 10 cm long; the tip of the forceps for models 11052–10 and 11152–10 were serrated and measured 0.8 mm in length × 0.7 mm in width and 0.5 mm in length × 0.5 mm in width, respectively. Monocryl monofilament absorbable sutures with an RB-1 needle (size 5–0 monofilament, Ethicon, San Angelo, TX, USA) were tested (Figure 3D). Monocryl monofilament absorbable sutures were chosen due to their high suture and tag retention when implanting transmitters in fish . Stab scalpels (Model BD Beaver Micro-Sharp Blades, Becton, Dickinson and Company) were 3 mm long and had a cutting angle of 15° (Figure 3E). Surgical tools used in testing efficacy of UV radiation exposure. (A) Needle holder, (C) forceps, (D) suture, and (E) stab scalpel. The needle holder had an area of concern (B) where the two halves overlapped. The stab scalpel had an area of concern (F) in regard to UV radiation penetration at the point where the blade was inserted into the plastic portion of the stab scalpel. The suture also had an area of concern (G) where the needle and monofilament were swaged together. Three experiments were conducted to assess the efficacy of using UV radiation to eliminate pathogens from surgical instruments. Experiments 1 and 2 had positive and negative controls. Positive controls (also called sham tests) consisted of exposing the tools to the pathogen but not to the UV radiation, and were used to demonstrate that the pathogen would grow on specific tools at the pathogen concentrations used in the experiments. A positive result for the sham control verified that if we observed a negative response from the UV treatment of the bacteria, we could conclude that the UV radiation was effective at reducing the population of the pathogen at that concentration. However, if the sham control failed to produce the pathogen, we did not use those results in our analysis because we would not be able to conclude that the UV radiation was the result of the negative response. Negative controls consisted of not exposing the tools to the pathogen but exposing them to the UV radiation. The lack of positive growth on a negative control demonstrated that the UV system did not introduce the pathogen to the tool (for example, cross-contamination from an earlier study or handling). If bacterial growth was observed on the negative control, the bacteria were incubated and grown on agar plates until we could identify characteristics that were consistent with the experimental bacteria or, conversely, from environmental contamination. Experiments 1 and 2 involving the bacteria (Table 5) consisted of four durations of UV exposure (0 (sham), 2, 5, and 15 minutes) and four bacteria concentrations (none (negative control), low, medium, and high); the bacteria concentration varied based on the pathogen (Table 4). Three replicates were used for each combination of UV duration and bacteria concentration. The one exception was R. salmoninarum, for which five replicates were used because the long incubation period (20 to 37 days) increased the chance for environmental contamination of the treatments. Tests involving R. salmoninarum included five test replicates. ‘None’ represents the negative control. Concentrations for ‘Low,’ ‘Medium,’ and ‘High’ are given in Table 4. The first experiment involved the exposure of forceps to the three bacteria species (A. salmonicida, F. psychrophilum, and R. salmoninarum) and then exposing the instruments to UV radiation for different lengths of time to test the hypothesis that UV radiation would be a viable option for disinfection of bacteria. Autoclaved forceps were exposed to each concentration of bacteria by dipping the tips about 5 mm into the confluent suspension for 5 seconds. For each group (that is, forceps exposed to none, low, medium, and high concentration of bacteria), the forceps were placed into the UV system immediately after dipping and then were exposed to UV radiation for a duration of either 0 (sham), 2, 5, or 15 minutes. The forceps were placed over one of the three large holes in the UV sterilizer platform (Figure 1A). The order of exposure time for each test was chosen randomly. After exposure, forceps were taken out of the UV sterilizer and the furthest extending 10 mm of the tips were rinsed with 5 mL of the appropriate sterile medium into a culture tube. Sham controls were dipped in the same way as the UV-treated forceps but were never placed into the UV system. Instead, immediately after the sham control forceps were dipped, they were rinsed in the same way as the UV-treated forceps. The negative control forceps were handled in the same way as the UV-treated forceps except that they were not dipped in the bacterial culture. Following the appropriate incubation period as described above, optical densities of the culture tubes were measured and samples were visually checked for growth. A sample was determined to have growth if it was turbid compared to the negative control and then verified by optical densities using a Nanodrop spectrophotometer (model ND-1000; Thermo Fisher Scientific, Wilmington, DE, USA). The optical densities were used only as a determination of presence (OD600 >0.00) or absence (OD600 = 0.00) of growth. Based on the results we observed using forceps and three bacteria in Experiment 1, further testing was conducted to examine the efficacy of UV radiation to disinfect other tools commonly used to surgically implant transmitters in fish: stab scalpels, 5–0 Monocryl monofilament sutures, and needle holders. This was done because microorganisms could possibly be shielded from UV radiation in areas on the tools where the UV light was not able to penetrate —for example, where the blade is inserted and epoxied into the plastic portion of the stab scalpel (Figure 3F), in the area where the suture needle is swaged to the monofilament thread (Figure 3G), and in the hinged area of the needle holders (Figure 3B). Stab scalpels, sutures, and needle holders were exposed to A. salmonicida using methods similar to those described above in Experiment 1. A. salmonicida was the only pathogen chosen for these tests because of the short duration needed to grow it successfully in the laboratory. Prior to testing, stab scalpels and 5–0 Monocryl monofilament absorbable sutures were new and sterile. Stab scalpels were submerged in the bacterial culture deep enough to cover the entire blade and the groove in the plastic portion of the stab scalpel (12–15 mm). After UV treatment, the stab scalpel was rinsed from just above the groove toward the blade. Sutures were exposed to the bacteria by being placed into the culture tube so that the needle (including the section where the thread is swaged onto the needle) and about 23 mm of the thread were submerged for at least 5 s. The culture tube then was inverted so that the entire thread (127 mm total length) would also be exposed to the bacteria. The suture was laid out on the fused quartz plate so that there was not any overlap. Following UV radiation exposure, sutures were placed into a tube with 5 mL of sterile media using autoclaved needle holders and incubated for 5 days while the suture remained in the culture. Needle holders were autoclaved prior to testing. To maximize the likelihood that microbes would remain in areas that were hard for UV radiation to reach, 1 mL of the culture (low, medium, and high concentrations) was pipetted onto the hinge area (joint) of the needle holder. The culture was not reused among needle holders tested. Immediately after exposure to the culture, needle holders were placed in the UV system for the prescribed amount of time (0 (sham), 2, 5, and 15 minutes). Growth for all tools was quantified as described for Experiment 1. We tested water mold by exposing three cornmeal agar plates with the pathogen, then exposing the agar plates to one of the prescribed UV radiation durations (0 (sham), 2, 5, or 15 minutes). No negative control was used for this portion of the experiment. The second portion of the water mold experiment was similar to Experiment 1 (forceps exposed to three bacteria) except that the forceps were exposed to the pathogen on solid cornmeal agar plates, resulting in similar pathogen exposure concentrations between all forceps for each duration of UV radiation exposure. The second part of our hypothesis was to test the effectiveness of UV radiation to kill the water mold S. parasitica, which was tested in two different ways. The first test used freshly plated water mold on cornmeal agar. The water mold was propagated on solid cornmeal agar for 5 days. A cube of agar (approximately 5 mm3) was then removed from the 5-day culture and placed on a sterile cornmeal agar plate (n = 3). Immediately after being placed on the agar plates, the plates were placed in the UV sterilizer and then exposed to UV radiation for 2, 5, or 15 minutes. An additional three plates representing a sham control were inoculated and not exposed to UV radiation. A negative control was not included in this portion of the study because the likelihood of environmental contamination was minimal. Following the UV radiation exposure, the plates were incubated at room temperature for 5 days to determine if there was any new mycelium growth. The second test in Experiment 3 used autoclaved forceps and a cornmeal agar plate with water mold that had been incubated for 5 days. Three replicates were used for each group exposed to UV radiation. The forceps tips (approximately 5 mm) were pushed into the agar with visible mycelium growth and closed. The forceps were immediately placed into the UV sterilizer for treatments of 0, 2, 5, and 15 minutes. After treatment in the UV sterilizer, about 10 mm of the forceps were rinsed with 5 mL of liquid cornmeal broth into sterile 14-mL Falcon culture tubes. A sham control was included in this portion of the study, in which forceps were exposed to the water mold using methods described above but were not exposed to UV radiation. Instead, the sham control was immediately rinsed after being exposed to the water mold. A negative control was used for UV radiation exposure treatment (0, 2, 5, and 15 minutes) and was handled in the same way as the UV radiation-treated forceps except it was not exposed to water mold. Samples were then allowed to incubate at room temperature for 5 days and 10 days before they were examined for growth by visually comparing the positive controls and UV-treated samples. Growth was determined by looking for hyphae that grew and was attached to the granules of cornmeal. RW is currently a master’s intern at Pacific Northwest National Laboratory (PNNL). RB, AC, LMM, and CW are scientists at PNNL. DG is the ecology group technical manager at PNNL. MG was a research associate at PNNL during the project. MBE is currently a fish biologist for the U.S. Army Corps of Engineers, Portland District. This study was funded by the U.S. Army Corps of Engineers (USACE), Portland District. With appreciation, we acknowledge the technical contributions to the project made by the following people from the Pacific Northwest National Laboratory: Amoret Bunn, Andrea Currie, Kate Deters, Gayle Dirkes, Jill Janak, Andy LeBarge, Tim Linley, Ann Miracle, Brett Pflugrath, and John Stephenson. Reference to trade names does not imply endorsement by Battelle or the U. S. Government. RW designed, prepared, and executed the experiments of this study. RW also collected data, analyzed results, and drafted the manuscript. LMM was critical in the organization and design of the experiment and assisted in drafting the manuscript. AC assisted with the study design and drafting of the manuscript. DG assisted with interpretation of results and drafting the manuscript. MG assisted in organizing and executing the water mold experiments. CW conceived the idea for the experiment and helped acquire funding for the project. RB and MBE conceived of the study, and helped with study design and funding. RB also assisted with interpretation of the results, and drafting of the manuscript. All authors read and approved the final manuscript.